Well....as someone who loves films, I can honestly say not very many films have me going through a spectrum of emotions like this one does. 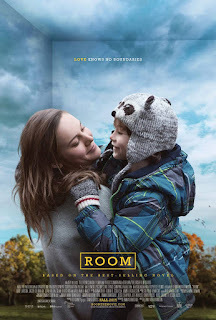 Room follows the story of Jack (Jacob Tremblay) and his Ma (Brie Larson) who are trapped in a shed that they call Room which is the only world Jack has ever known. Eventually, the two are able to escape Room, but must deal with the hardships and wonders of the outside world. I'll start off with the acting. Brie Larson delivers once again an absolute marvel of a performance. In Short Term 12, she gave us all a signal showing us what she is made of. But in this, she gets to throw out a gauntlet of emotions as she is unconditionally loving yet reveals a rather self-loathing maternal psychosis through sudden shifts in the way she lifts her eyebrows and tone of voice. Her Ma tries to shield Jack from the world yet is still aware that she can't hide him forever and seems afraid to face the world herself. But another star who is also a complete revelation is Jacob Tremblay as Jack. Even in the grimmest of situations, he is still able to capture a childlike wonder as we see the world and story through his eyes while at the same time, he captures an anger and frustration that is wise beyond his years. What a find this kid was and here's hoping he has a bright future ahead of him. Joan Allen is also in this as Jack's Grandma and while she has a smaller role, she is still a very warm and graceful presence that serves as a perfect foil to Ma. Next, I'll delve into the direction from Lenny Abrahamson. Wow, this guy is a genius. What he, and the rest of the filmmakers do, is capture the grim and claustrophobic nature of Room in contrast to the bigger and brighter world. The writer Emma Donoghue captures the grayness amongst the two main characters and does a great job making it seem like Room is its own small world with how Jack greets the various objects around the room each morning and how both characters use their television as their main means of connection to the outside world. The cinematographer Danny Cohen creates a brilliant contrast of Room and the world by using a darker color scheme in Room and when he films the skylight of Room, where we see the sun shine, he uses that as something of a bridge between Room and the world. Also, the editor Nathan Nugent deserves a special shout out for keeping the film at a tight pace, thus creating tension that literally had my heart pounding. Plus, when the film begins and we're in Room, I appreciated how we were kept in Room until Jack finally escapes. It doesn't cut to the police or the townspeople trying to find them. We don't leave until Jack and Ma do. Overall, Room is a rare masterpiece that will leave your heart pounding as the film begins and progresses then overwhelmed with joyous yet tearful emotions by the time the credits roll. This movie is about the parent and child in all of us as well as the powers of motherhood and its gripping realism will likely still have me trembling for days and maybe months to come.